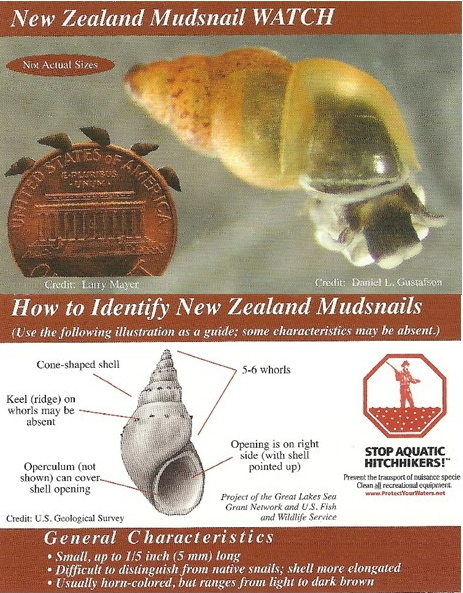 There are a few invasive species present along or in the Brule River that need monitoring, but one of the most troubling potential invaders is the New Zealand mudsnail (click on Mudsnails to learn more). In 2013, mudsnails were discovered for the first time in inland Wisconsin waters in Black Earth Creek, a popular trout stream in southern Wisconsin. This species was almost certainly introduced via contaminated fishing gear by an angler who had been fishing in the western U.S. where a number of popular trout streams are infested by the species. In 2015, New Zealand mudsnails were also first collected from a tributary to the Sugar River near Verona (click on Mudsnail spread to learn more). Biologists with the River Alliance of Wisconsin believe the Brule River has a greater probability of being infected by this snail than any other river in the state. This is due to the popularity of the Brule to anglers from across the country. We need to prevent the introduction of New Zealand mudsnails into the Brule River! The River Alliance of Wisconsin suggests a number of ways to clean our wading gear after fishing a different body of water (click on Practice Clean Angling). Please note that freezing your wading gear for 6 - 8 hours is an effect way to prevent accidentally introducing New Zealand mudsnails into a river. These guidelines downloads as a pdf file that require Adobe® Reader®. If you don't have this software you can download it free by clicking on the link below.